What does Jimi Hendrix and South Korea have in common? Luna Lee apparently. Let me explain. First, even if you don’t like Jimi Hendrix, listen to this video. Now, I doubt there are few who would argue about Jimi’s great guitar skill. Hell, I don know how to play but could see his passion and energy and appreciated it when I do occasionally listen. I hope I can meet her and thank her in person for that awesome and inspiring performance! Please share this around! Author DragonDonPosted on September 6, 2013 Categories ContentTags entertainment, great guitar, inspiring performance, jimi hendrix, Korea, korean connection, music, South Korea, talent2 Comments on What does Jimi Hendrix and South Korea have in common? One of the things I have missed from home is watching my musicians friends perform. Tonight a friend of mine had introduced to this place that is really close to my community club! How awesome is this?! This place is called Sound Hill (Korean 소릿골) and not only ifs the guy singer pretty damn good, he is also the owner AND bartender! Check him out! So I came across this article about how Canada can take a lesson from Korea. While the odd point I am in agreement with, there are many things that the writer just completely is ignorant of. I am surprised at this, especially given the fact that he claims to have taught in Korea and ‘written extensively’ about Korea. Guess he is just wearing some very odd shaded glasses. Let’s pick out a few points that are severely missing/glaringly wrong. Onto the rest of his article. I would like to know about his definition of ‘household’ name. See, LG used to be known as Lucky-GoldStar. They used to make electronics products of low-end quality. I recall buying a tape deck ghetto blaster at my local supermarket back in the early 80s that was a GoldStar brand. So LG HAS been a ‘household’ name for a long time. Now, if by household, the writer mean ‘quality’, then perhaps he may be closer to the truth of his words but without that clarification, the words he uses are meaningless and lets people assume things without proper knowledge of the subject. Has anyone ever really looked into what GDP is? I decided I wanted to know the numbers to see this for myself. I got lost and confused because StatsCanada website listed a TON of GDP ratings. So which one did he use to justify this ‘outpaces Canada’ statement? Let’s see if I can find something and not just go by some other random news article that he saw. Well, there isn’t one obvious answer but http://www.indexmundi.com seems to have a simplified chart. Let’s just look at the numbers by year for the last five years. Well, just by looking at these numbers it is obvious that Canada’s GDP is still significantly higher that South Korea. Was the author talking about GDP “growth”?? In which case Canada’s GDP rose 5500 while Korea’s rose 7600. Sure, that’s higher but given that South Korea is just really getting going, of course it’s growth will be higher that other, well-established countries. This is rather logical and nothing new here. Not much of a lesson here unless Canada abdicates from the world and starts over then it can claim 100% growth rate because it started from zero. THEN South Korea could learn something from Canada right? So far, nothing but let’s see where this goes. Ah yes, learning English is a key factor to South Korea’s success right? Sigh. The author seems to have miraculously forgotten that Canada already speaks English! So does the US, UK, Australia…this by no means, is in any way related to a ‘lesson for Canada’. Yes, there are quite a lot of factual and valid points made here. South Korea alone will fit inside of Ontario 10 times and yet Canada only has 10 million more in population that the Greater Seoul area. Education definitely needs some help but having seen both sides of the pond, the education system is sorely lacking equally in both countries. I can’t necessarily agree that we need the Government to ‘do the right thing’ here and tell educational institutes how to run their business. Sadly, the work that has been done by the Canadian Government so far does not inspire me. I mean, how smart is it that teachers in public high schools are now told that they cannot fail a child? This will make for smarter university students how? No amount of strategy will fix this poor base of students to begin with. Wait, wait, wait. Hold on there. We haven’t’ even established that anything is needed at all and you are already onto some supposed second lesson? So Canada need more entertainment now? Given the deplorable conditions of ‘lower-wage economies’, one would think that working on quality over quantity would be a better way to go. Why is everyone arguing about simply making more money? What ever happened to the welfare of their own citizens? Oh wait, we can’t compare this to Korea because Canada’s medical system would fall apart compared to Korea’s in many, many aspects. Costs of medical attention here is way cheaper for average things. I mean, no one can walk into a hospital, say they have a problem with their foot, get an x-ray done ON THE SAME DAY and pay only $4. Don’t give me this ‘but it’s included in our health care system’. That only goes to show you how ignorant you are of where you actually pay for it and you can be damned sure you are paying more than $4 for that x-ray. Don’t even get me started on how pathetic the disabled people are preyed upon. What I am seeing is more people writing articles simply to ride the ‘Gangnam Style’ popularity. By putting the topic in their article, they hope to garner more attention in the hopes that it turns into revenue. They also try to compare one freaking success that is way outside of the ‘bell curve’, and not the norm, and people think ‘yeah, why can’t we have such a success’. That’s because the majority of industries are self-serving and could care less about real talent than manipulation of what they already have. There we go with the presumption that the readers agree with any of these lessons. Still, the writer is correct but it’s not some awe-inspiring insight. It’s statement that can be broadly applied to any and everyone. Now here is where I start to laugh. “Korean students embraced learning Mandarin” Really? This is like saying “Canadians embraced learning French.”. Not so much. Chinese has been taught here because at one point in Korea’s history, Chinese was all they had for writing. It’s not like there was a sudden surge to learn, it’s already part of their culture. This may be true but then again, Canada’s prime source of income isn’t exporting goods like South Korea is. An unfair comparison to say the least. That’s not to say that Canada shouldn’t look at such thing, it’s just a much lower priority because we have ‘big brother USA’ keeping up warm at nights. Indeed, this is a good observation. Perhaps the Canadian mindset is so stuck in ‘we have everything we need, so no rush to do anything at all’? The basis of this statement means that everything the author said is true, factual and can completely be applied to a country with different cultures, different geographies, different politics, different everything really. It is also a severely broad statement that can also be applied to any other country. Having lived in South Korea for over 2 years now, and see first hand how the education system is pretty broken both here and in Canada I wouldn’t take any educational lessons from South Korea at all, ever. For one, they focus on nothing but memorization. The kids don’t have much of a life when they are in school from 8am to 10pm(used to be midnight at times till the Government put its foot down and passed a law to make it illegal to have a private institute open past 10pm). They used to go to school every other Saturday but that too was recently stopped by the Government. This just meant that the private institutes get more business and some school even have longer hours two days a week because they aren’t open on Saturdays any more. No, I will not be recommending a lesson from the education system here at all. I would never give up the go-cart building, tree-climbing, hide-and-seeking, snow-fort-making evenings and weekends just to be educated by a system that says ‘because I said so’ when I ask ‘why is the sky blue?’ (true story from a friend’s child, sadly this was in Canada). There is an inherent respect for elders. The problem with that is that you NEVER question your elders. Even if it means a potential new discovery or new way at viewing a problem. Innovation simply dies when you aren’t allowed to explore. I am pretty sure most of you have seen Toy Story. 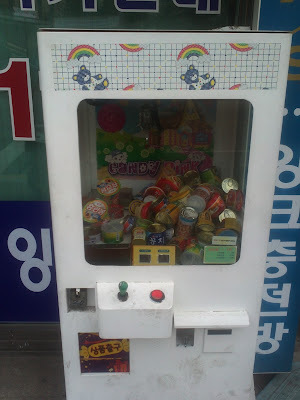 Well, was walking down the street and kinda saw a different version of the Claw Game. A closer look reveals something just not quite right with this game. 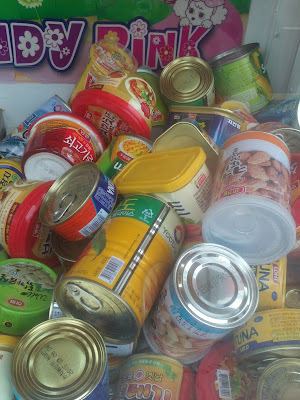 Author DragonDonPosted on May 14, 2012 January 10, 2013 Categories ContentTags entertainment, game, Korea, photos, picture, South Korea, toy storyLeave a comment on The Claw Game! Random people will come downtown Uijeongbu and simply start playing. Normally just between friends and jamming, but sometimes for people walking by. A culture can be defined by many things, least of all music. Music has a way of transcending barriers and has often been called the ‘universal language’ (or was that math or Love…I don’t recall…). Still, when ever I am exposed to another culture, I try to see what it’s music is like. It’s not hard to find something you like in any culture if you look hard enough. Here are my favourites that I have found so far. The first is G Dragon. One might be tempted to say that I like him purely based on his name, and truth be told, I started listening based on that name alone but then the music I liked. So it worked out :) In face, this song is G Dragon and T.O.P pair of singers. The next is another song, from their same album. The word you hear repeated is supposed to mean Knockout. Funny thing about translations, I have not been able to find that translated by an online translation yet. I do know that the second part of the work (guy-yo) means go or go out. Still, it’s a funky little tune. And the last one, for today, is your very typical teeney type of band. Dal Shabet, a 6 girls and the video truly reflects their market. Still, I find their beat for this song rather interesting so here you go. Try NOT to get it stuck in your head :P I won’t bother commenting on the implications of their other song, Pink Rocket. I’m sure I’ll be adding more songs as the years go by. You can be sure that eventually the Korean groups will be heading that way…as soon as the big industry controllers over there let them in. It is inevitable as their popularity is growing fast in this part of the world.